If you drive along Ontario Highways, you have likely seen this pretty feathery tall plant waving in the breeze on the edge of wetlands. Pretty it may be, but it’s also a nasty, vicious, intruder which spreads quickly and out-competes native species for water and nutrients. It releases toxins from its roots into the soil to hinder the growth of and kill surrounding plants. While it prefers areas of standing water, its roots can grow to extreme lengths,allowing it to survive in relatively dry areas. Where these invaders spread, animal life especially species at risk like Fowlers Toad and the spotted turtle disappears. So what are we doing about it? Not enough! The Invasive Alien Species Partnership Program used to help by supporting 170 projects with $5.6 million in funding to help community groups learn about these invasive species, but the federal government cut this program back in March 2012 as part of the Omnibus Bill C-38. So now all that we have left are adhoc piecemeal efforts by smaller community groups. Recently, two new organizations, the Great Lakes Phragmites Collaborative, based in Michigan, and the Ontario Phragmites Working Group, have emerged to educate the public and share techniques on managing the mighty reed. So here is what it looks like – this picture was taken at Singing Sands in Bruce Peninsula Nation Park on Lake Huron. The Healthy Lake Huron website has more information on how phragmites are being handled as well as information on other water quality issue on Lake Huron. 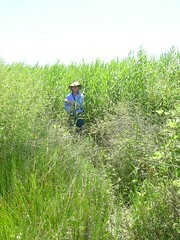 and another link on Management of Phragmites. Please use the reply link for this page if you would like to volunteer locally to help eradicate this invasive species.